The washout of the Welsh Dragons and Centaur camp and tournament last week in the UK has left the clubs involved facing a financial headache. 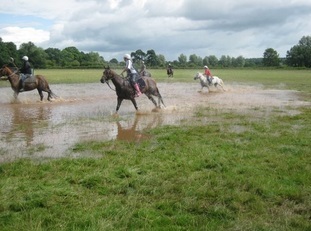 The camp had to be called off half way through and the tournament couldn’t run. Now, without the full tournament entry fees coming in, the organisers are looking at a large deficit, as a lot of the costs associated with the venue had to be incurred regardless of whether the tournament ran. Welsh Dragons Chairman Jeff Parr said that the site hire costs and the cost of hiring the toilets and the showers will all still have to be paid in full, though hopefully they have avoided paying items such as the paramedic cost. The camp part of the week was budgeted to make a loss but the organisers were hopeful that this year the tournament would cover that loss and make them a profit. The Welsh Dragons reckon they need about 100 players at their tournament to cover all the costs and this year they had entries totalling over that figure and so should have made a profit. 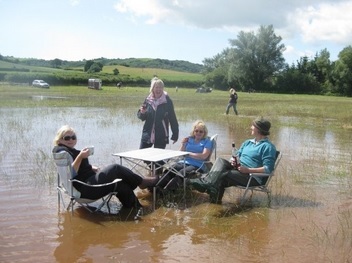 A wet weather tea party at the camp, how British! The UK gets ready for their all new sport – Waterpolocrosse – this they can definitely win a World Cup in!